Photograph courtesy Roger Geach. 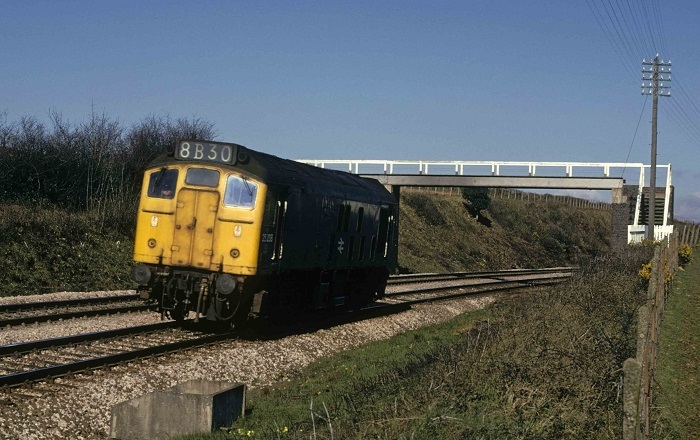 25238 en-route from St Blazey to Liskeard for Moorswater to pick up a load of clay hoods, March 31st 1975. The sixteen year seven month career of D7588/25238 included allocations to Western, Scottish & London Midland Region depots. Center lampbracket & other fittings removed (No.2 end only). Time between last Classified repair and withdrawal: 37 months. Time between withdrawal & scrapping: 33 months. 25238 was the 49th Class 25 to be withdrawn, one of four retired during October 1980. After withdrawal 25238 was moved to Swindon Works on October 27th 1980, being scrapped there by the third week of July 1983. Noted Derby Works March 1977. Noted Glasgow Works August 1977. On August 4th 1968 the SLS 'Farewell to BR Steam' railtour was worked from Stockport to Manchester Victoria by 7588, being replaced by Black Fives 44871 & 44894. Condition April: green livery with full yellow ends, no frame level stripe, still with 'D' prefix, gangway doors still in place. On August 1st 1970 the 08.15 Leicester - Blackpool North was worked from Nottingham by sisters 7588 & 7589. The next weekend (Aug 8th) 7588 worked the Nottingham - Llandudno Town service to Derby. On April 7th 1972 the 08.20 Paddington - Cheltenham Spa was worked to Swindon by 1645 & 7588. Somewhat west of their normal haunts, 5182 & 7588 were noted at Llandilo Junction with a special freight comprised of ‘Grampus’ wagons on June 21st. Photograph collection of webmaster. 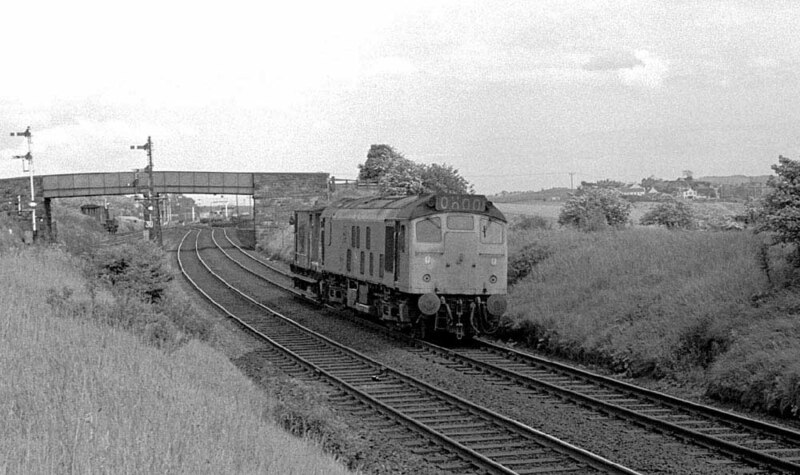 7588 circa 1972 heads west somewhere near Lydney where the Gloucester - Chepstow line runs closely alongside the River Severn. The afternoon Bristol – Plymouth parcels gained a reputation for unusual combinations of motive power, perhaps as a dead head move, on May 2nd it was hauled by 7588 & 1064! The 07.10 Derby - Matlock and the return 08.00 to Derby were worked by 25238 on December 15th 1975. Photograph courtesy Tony Sayer. 25238 sets out from Dunfermline Townhill with a solitary brake van on September 15th 1976 heading for its next assignment. This was one of the earliest boiler equipped Scottish casualties, being withdrawn in October 1980 from Eastfield. The last five years of service for 25238 was spent allocated to Scottish Region depots. On April 8th 1977 the 08.38 Glasgow Queen Street - Oban saw ailing 27023 replaced at Cowlairs Junction by 25238 for the run to Oban, returning with the passenger diagram to Glasgow Queen Street. The next day (9th) 25238 worked the 09.52 Dundee - Glasgow Queen Street. The 21.40 Edinburgh - Carstairs was worked by 25238 on May 4th 1977, a route over which 25238 would record a number of passenger turns. The 08.45 Edinburgh - Aberdeen and 14.35 Aberdeen - Edinburgh were worked by 25238 & 25068 on September 3rd 1977. 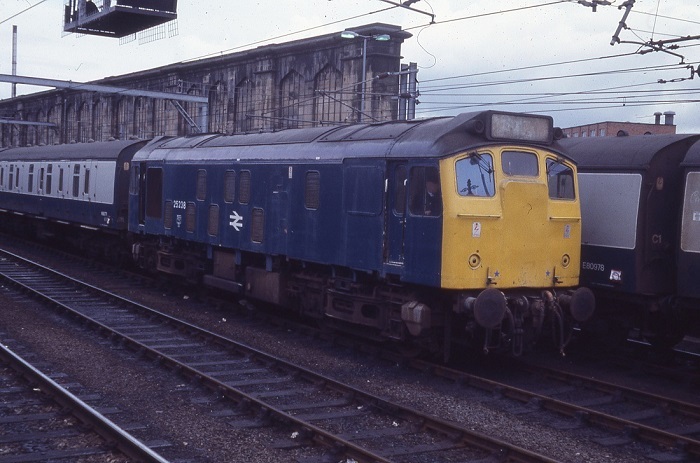 25238 at Carlisle on May 13th 1978. This was the only non dual-braked locomotive from the batch 25228 - 25247, hence perhaps its early demise. On June 3rd 25238 worked the 08.05 Dundee - Glasgow Queen Street. On June 6th & 7th 1978 the 21.40 Edinburgh - Carstairs were worked by 25238. Late on the evening of August 8th 25238 & 25083 were noted on southbound vans at Edinburgh. On September 21st the 09.50 Edinburgh - Inverness was worked by 25238 & 26018. The 17.15 Edinburgh - Cardenden was worked by 25238 on May 5th. 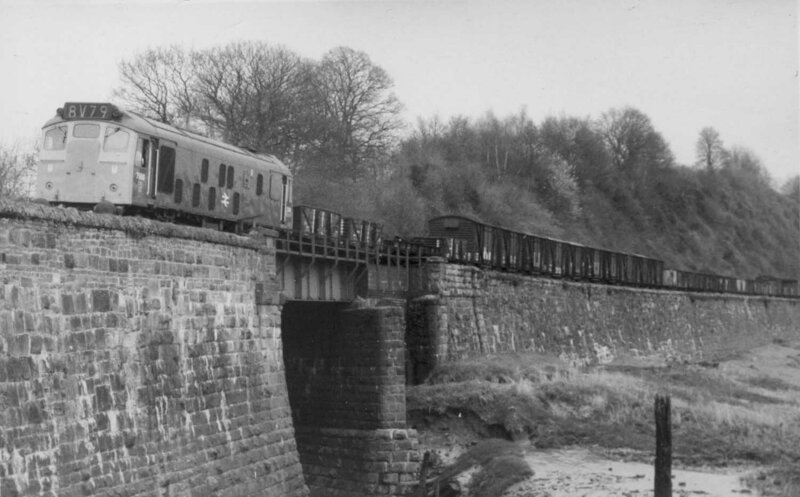 On May 19th the passengers on the 20.47 Bidston – Wrexham Central diesel multiple unit were rescued by 25238 after failure of the unit at Hawarden. Immediately after this the Class 25 returned to Dee Marsh to collect recently repaired Class 507 stock that was making its way from Horwich to Birkenhead. A relief Scarborough - Glasgow Queen Street on July 12th was worked forward from Edinburgh by 25238. The last recorded passenger workings for 25238 took place on July 18th/19th 1980, on July 18th 25238 & 26032 worked the 17.25 Glasgow Central - Stranraer Harbour, the same pair then worked the 19th's 01.20 Stranraer Harbour - Blackpool North to Carlisle. It is presumed the same pair of locomotives returned from Carlisle on the balancing working, the 09.43 Blackpool North - Stranraer Harbour (from Carlisle or from Ayr?). 25238 was withdrawn on October 13th 1980. Condition Final: blue/yellow livery, gangway doors sheeted over, blanking plates fitted, hand/footholds plated over, three-rung bogie mounted footsteps, ridge sided sandboxes, white headcode display (both cabs), centrally mounted lampbracket and other fittings removed from cabfront (No.2 cab only). Page added September 11th 2013.